Custom Silver Electrodes available now. with silver electrodes still available as required. The reason for this is; I am running short of printed circuit boards for this machine and have decided not to get any more produced. I have been making this unit since 2004 and it is very labour intensive - everything is done by hand. I will still be producing the "Three Nines Plus" unit as I have plenty of printed circuit boards, and they are less labour intensive. I am thinking of making the MProCSG circuit diagram and programmed chip available for anyone interested in making there own unit. The information below has been left for historical reference..
Why choose the MProCSG over other generators? This generator is fully automatic. No external timer required. You don't have to sit there with a timer. No chart required for different temperatures etc. Only makes high grade colloidal silver - because it will only accept high grade distilled water. The unit will actually turn itself off if the wrong water quality is used. The MProCSG does not produce cloudy colloidal silver. 3 year warranty or more - just ask! Built in Australia with high quality components, not mass produced in China. Microprocessor control for consistent production. Withstands short mains power interruptions. The output withstands a continuous short circuit. In fact the unit turns itself off in that case. Visual display of generation progression. LEDs light at each stage of the process. No messing around with alligator clips - this unit uses an electrode plate with proper sockets to match the electrode plugs. Supplied complete with 99.99+% 10g (2.6mm) silver electrodes, not the thinner 12g or 14g variety. Warranty and service backup direct from the designer & manufacturer: Kestar Enterprises. Make your own Colloidal Silver (also known as Silver Water) for less than a dollar a litre, with a quality which is as good or better than you can buy. Colloidal Silver is pure water which has silver held in colloidal form; i.e. ultra-microscopic silver ions in solution (ionic silver) and ultra-microscopic particles of silver held in suspension by a positive charge on each atom. The new design generator has continuous monitoring of the 'solution', shows the progress via LEDs and switches off automatically when the desired concentration of the highest grade of Colloidal Silver is reached - approx 5-10ppm (with optional sounds to indicate progress and completion). Make your own High Quality Colloidal Silver for less than a $1.00 per litre. Fully automatic - you can set and forget. This generator does not claim to be "Constant Current". Please see the page devoted to talking about this subject. Internal circuitry converts the 10VAC input into approx. 30VDC, current controlled, for use in the production of high grade Colloidal Silver. All operations are controlled by a microprocessor so that front panel controls can be minimised and become multifunctional. The unit is mains powered via a 240VAC to 10VAC plug pack (supplied). The MProCSG requires High Grade Distilled Water which is converted into high grade Colloidal Silver. The MProCSG unit actually tests the water to ensure that is high grade distilled water. If the indicator does not start at the '1' progress light position (when the electrodes are lowered into the water), the water is not of high enough quality. 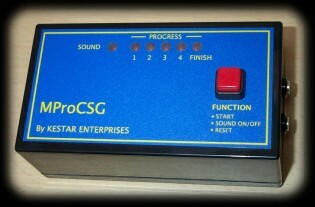 The MProCSG does not require a timer - internal or external. The unit switches off automatically when the desired concentration of the highest grade of Colloidal Silver is reached. The MProCSG produces 500mL of high quality Colloidal Silver per session. 135mm (approx. 5 1/4") by 75mm (3") by 50mm (2") plus feet. Note: The silver electrodes are available as a separate item as well. Custom length electrodes are also available. The MProCSG is designed and professionally produced in South Australia by Kestar Enterprises using high quality components and parts. Each MProCSG system is protected by a three year warranty for faults in workmanship in manufacturing and parts. Warranty conditions are detailed in the handbook supplied with the system. Kestar Enterprises have been using the MProCSG unit to produce high grade Colloidal Silver since September 2004. Click HERE for details and price.